Today’s guest post is by Hubble Space Telescope astrophysicist Dr. Jennifer Lotz. How deep can we go? What is the faintest — and possibly most distant — galaxy we can see now with the Hubble Space Telescope? This is the challenge taken up by the Frontier Fields, a new campaign to see deeper into the universe than ever before. It is thrilling to push past the limits of our knowledge of the universe. But the Frontier Fields are motivated by more than record-breaking. With a great deal of effort, Hubble is starting to capture light from galaxies that shows them as they appeared in the first few hundred million years of the universe. Sometime between the Big Bang — more than 13 billion years ago — and today, the Universe evolved from a hot, smooth sea of protons, electrons, and dark matter to a collection of billions of individual galaxies separated from each other by vast regions of mostly empty space. Within our own Milky Way galaxy are billions of stars forming out of clouds of gas, with planets surrounding almost every star. How did these “billions upon billions” come to be? Very distant galaxies with look-back times of 13 billion years or more appear very, very faint. Just how faint? 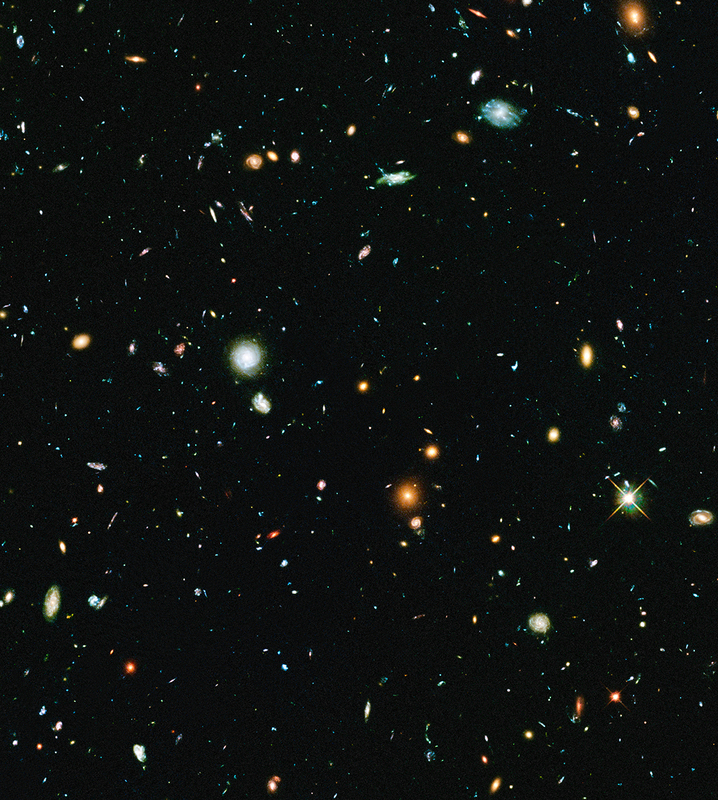 The faintest objects that the Hubble Space Telescope has seen are galaxies whose light we have collected by looking a one small piece of sky for hundreds of hours — the Hubble Ultra Deep Field. Those objects are some 4 billion times fainter than the faintest star the human eye can see. But it turns out that this may not be faint enough to see the era of cosmic dawn, when the lights from the first stars and galaxies turned on. Even with the Hubble Ultra Deep Field, we have just a handful of galaxies detected at these early times. Even though they appear very faint to us, these early galaxies we have seen are likely to be the biggest and brightest objects around at that time. In order to understand how and when galaxies like our own Milky Way first formed, we need to peer even deeper into the early universe. 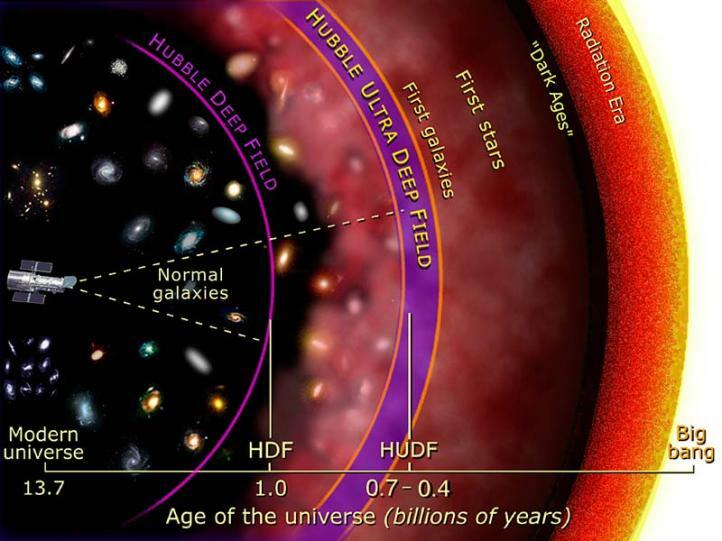 Illustration of the depth by which Hubble imaged galaxies in prior Deep Field initiatives, in units of the Age of the Universe. 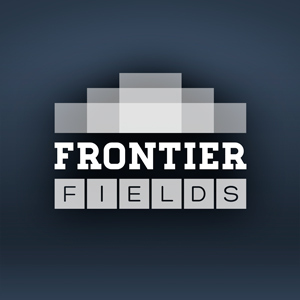 The goal of the Frontier Fields is to peer back further than the Hubble Ultra Deep Field and get a wealth of images of galaxies as they existed in the first several hundred million years after the Big Bang. Note that the unit of time is not linear in this illustration. 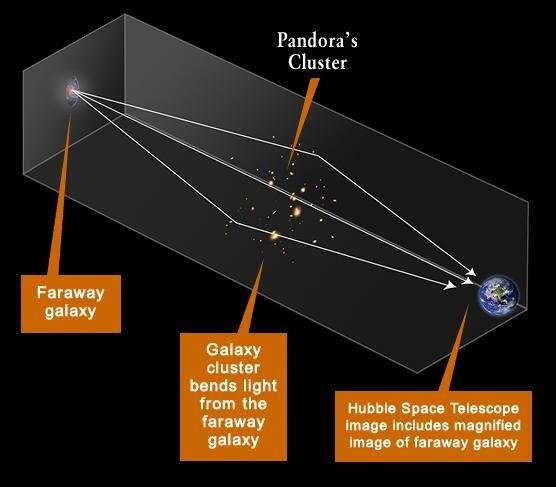 Illustration Credit: NASA and A. Feild (STScI). The James Webb Space Telescope, with its much larger light-collecting area and infrared sensitivity, is designed to study these early galaxies in great detail. But JWST is still years away, and our knowledge about the first galaxies is extremely limited. By using a trick from Einstein’s theory of general relativity, Hubble is attempting to get a sneak peek at these very faint and distant galaxies. The most massive objects in the Universe — very massive clusters of galaxies — bend space in such a way that light rays passing by a cluster will also be bent, much in the way light passing through a telescope is bent. This is called “gravitational lensing,” and these clusters act as nature’s telescope, magnifying and stretching the light from those galaxies located behind the clusters. The Frontier Fields is observing six of these massive clusters of galaxies. 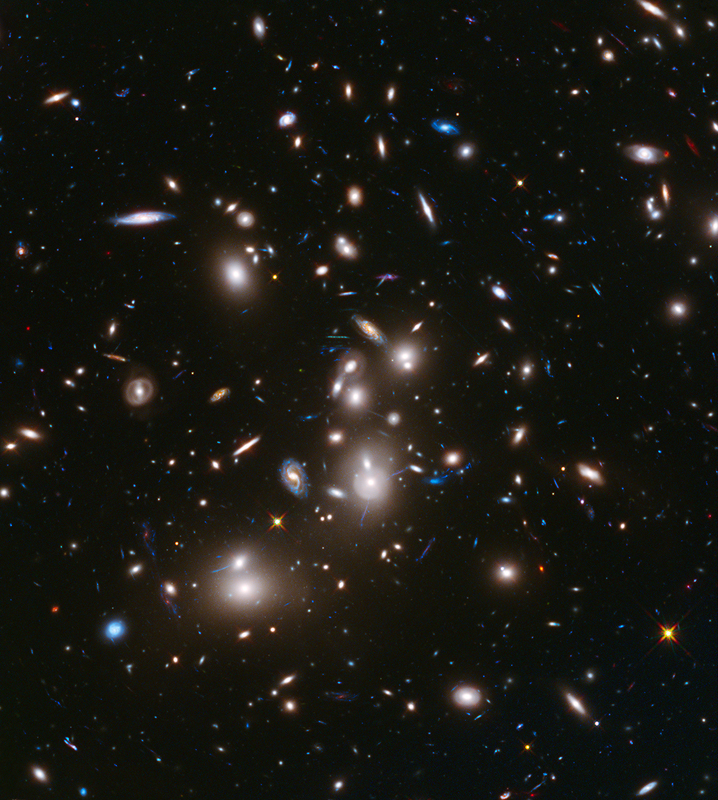 Due to the boost from the cluster lensing, the images obtained by the Frontier Fields will probe galaxies ten to twenty times fainter than the objects seen in the Hubble Ultra Deep Field. In combination with six additional “parallel” fields, areas near the Frontier Fields regions that lack massive galaxy clusters but can be observed simultaneously to obtain additional “deep field” images, these images are expected to give us a better understanding of how and when galaxies like our Milky Way formed. While astronomers work to understand these first images, Hubble is moving on to the next cluster — MACS0416-2403. Expect many more beautiful and deep images over the next few years, and a new understanding of cosmic dawn.